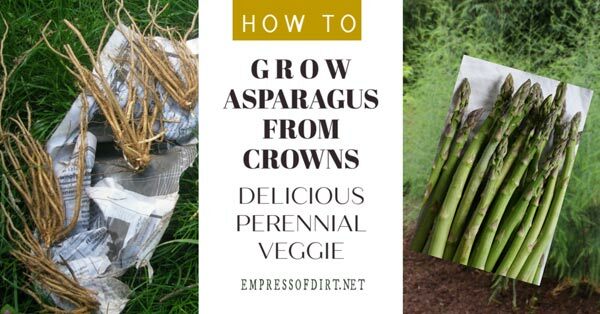 Today we’re talking about how to grow asparagus from crowns and how long it takes to have your first harvest. The crowns include roots and do not look like the part of the plant you eat. I’ll show you how to plant them and what to expect. While I grow them for the food—this is my favourite recipe for asparagus—now that I see how lovely they are, I like it equally well as an ornamental plant. New to asparagus growing, I ordered my first crowns by mail-order years ago. I had read a lot of information about asparagus growing that set my expectations low, but it was actually really simple. As a perennial vegetable, you pretty much plant it and give it minimal care like other perennial plants. 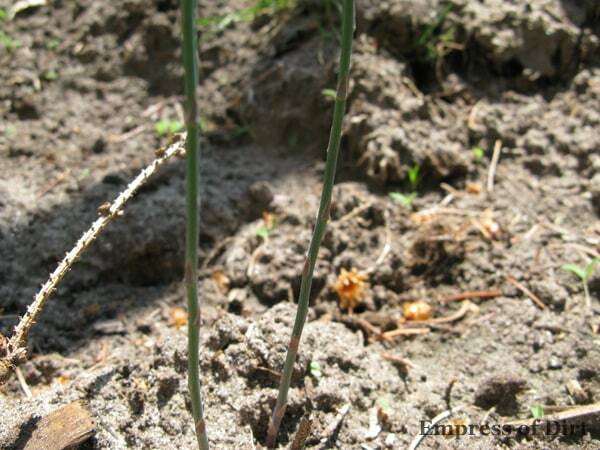 Planted in early spring, asparagus grows rapidly right away. I had heard you shouldn’t harvest the plants in the first year, so the crowns can get well-established, but my stalks were large and abundant in that first season, so I harvested them anyways. They were delicious! Since then, the crowns have produced large crops year after year. Each year, I harvest as much as I need, and leave the rest to continue growing. Besides the food they provide, these are really beautiful plants. Some years mine grow over 6-feet tall, forming a lovely privacy barrier in the back of the garden. I would grow them just for this purpose, even if they didn’t provide delicious food. 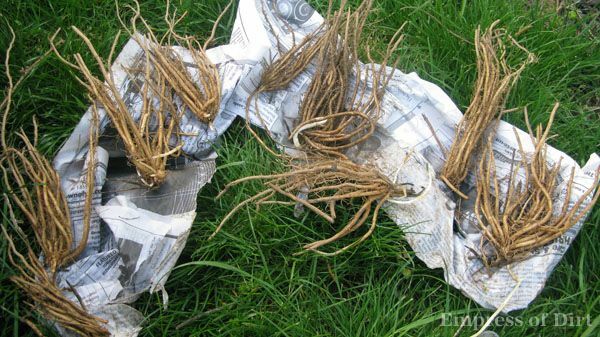 Asparagus crowns (the root system of a young asparagus plant used to start new plants) can be ordered by mail in late winter. 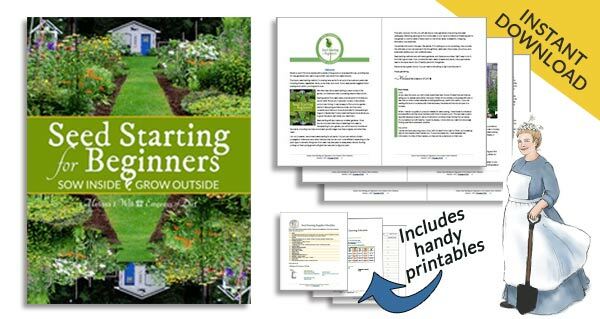 Garden nurseries will ship them when the time is right to plant them in your area. You need to have a garden bed all ready. It’s best to do this prep work in the fall (digging and adding mature compost) so you can get the crowns in the ground as soon as they arrive. I started my asparagus at the same time as cold-loving spring crops like peas. I ordered ten Jersey Giant crowns by mail and planted them at the end of April into a new raised bed. I never had room to grow asparagus before so this was a welcome adventure. This lists organic seed and plant mail-order companies in the United States and Canada. You may want to contact one local to you and enquire about crowns. Choose a variety of asparagus suited to your growing zone. Most are suited to hardiness zones 3 to 8. Plan ahead. You may need to place your order in late fall or early winter to ensure spring delivery of the crowns. Prepare your garden bed in fall so it’s all ready for planting in early spring. Asparagus likes pH-neutral soil. My soil is quite sandy and the asparagus grows rapidly here (zone 6). These are my notes from the first year I planted asparagus. The ‘crowns’ are really roots (to my way of thinking). You plant them over a little mound of soil with all those little pieces aiming down, like a wig of long hair over a head. I wish the instructions had said this because I initially tried to plant them upside-down. Some of these photos were taken in different years so that’s why the garden bed appearance varies. There are many skinny spears from each crown and some are up to 2 feet tall. So far, so good. According to the instructions, “next spring a light harvest of shoots can be taken.” The plants are mature after three years. 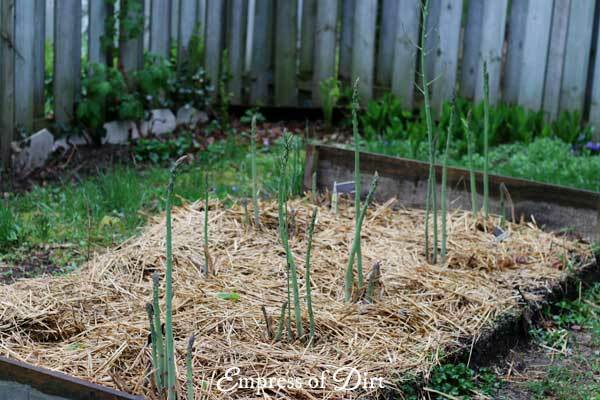 This bed gets a lot of weeds, so straw (or other) mulch is highly recommended. This was the first year. After this, I started using straw mulch to keep the weeds down. It doesn’t take long until the asparagus thickens up top and becomes both an edible and ornamental plant. After a few years, mine started growing 6 to 8-feet tall each year. My sandy soil and the location of the bed seem to make it a magnet for weeds. Should I cut back my asparagus plants in the fall? Most advice says never trim the green foliage. The plants need it to gather fuel for future growth. Instead, just cut back any brown (dead) parts in the spring and leave everything else alone. Sounds like a plan. During the winter months I apply a thick layer of mulch on the bed to make sure the super cold weather doesn’t damage the crowns. Yes! After the first year, I started harvesting the spears in mid-spring. Now, a few years later, I have more than I can eat and share the surplus. Absolutely delicious. And, as I mentioned, asparagus is a very pretty plant. I’d grow it even if I couldn’t (eventually) eat it. Containers | Plant lists, project ideas, creative planters. Fruit | Creative and practical ideas for strawberries, apples, raspberries, and more. 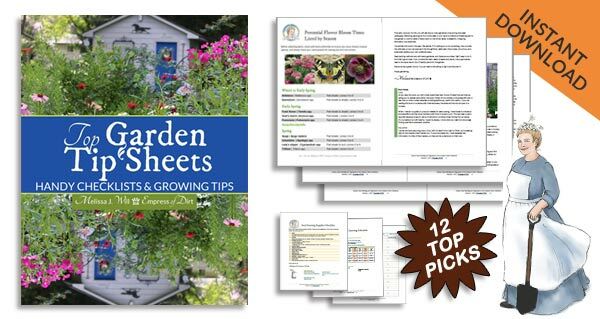 Outdoor Herbs | Tips for annual and perennial herb growing. 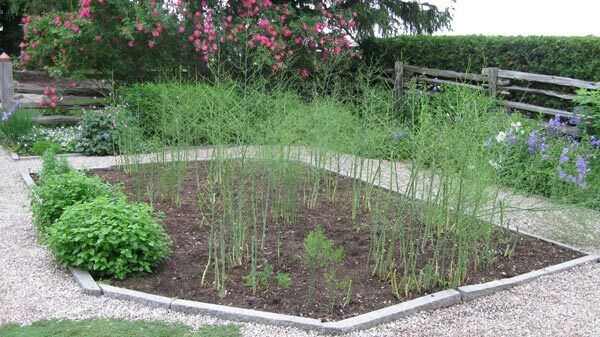 Do you have any advice for a wild asparagus patch that has WAY too many weeds? I moved to a house that has a LARGE wild asparagus patch. I don’t know how to take care of it. This is the third year I’ve been here and it just keeps getting more and more weeds. Too many to pull up and I can’t transplant the asparagus either. I tried to dip up some and the roots, but so intertwined. I’m afraid all the weeds are going to start killing the asparagus. I don’t know how the old owners cared for it. Hi Kate, Not a fun problem! If it was mine, I would dig them up and replant a select amount in a new garden bed or containers or raised beds. It’s a lot of work but rewarding in the end. I love asparagus and will try this, tried before and they never came up. Thanks. 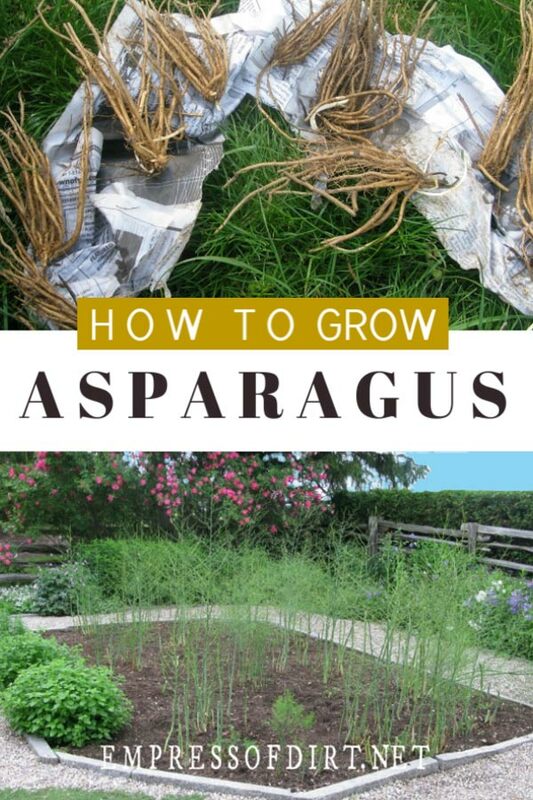 I love asparagus and plan to plant some this fall. I think thats possible, guess the growers will let me know. I found a site, andy’s asparagus that sells 3 year old plants… no long waiting! You don’t say how big your bed is, length, width and depth would be nice to know. I have 4 4×4 boxes that are 6″ deep. I’m wondering if I should stack a couple to make it 4×4 x 12″ and if 1 bed that size will grow enough. I live alone but my daughter lives next door and she can really put away the asparagus and cheese sauce! Can’t wait to try your roasted asparagus recipe with my own home grown asparagus next spring! 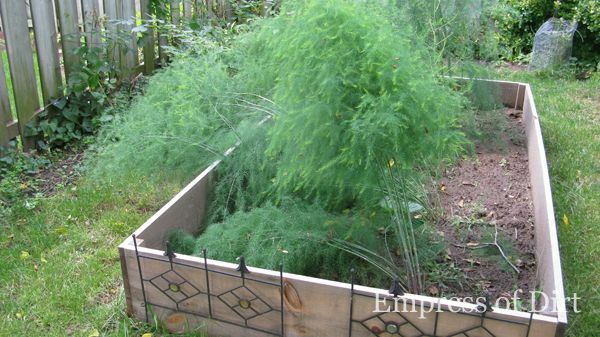 My asparagus bed is 4×8 feet and has 10 plants. I LOVE Asparagus, and being a dog Mom.. want to grow things that are safe around dogs. thank you thank you thank you a thousand times over! delighted to find you and your smart ideas. Good luck with yours, hope it does well over the winter. I’m very curious to know what this asparagus will taste like….